Although one of the best documented alien vertebrates in Europe, historical and current datasets on RRP invasion success and demography have not been systematically collated and analysed. This paper therefore aims to bring together, verify and make available this information. Existing distribution and demographic data for the RRP in Europe were collated from the following sources: (a) literature search; (b) bird sighting databases; (c) regional bird experts; (d) RRP roost counts. With this data, we evaluated population size and growth per population, country and the whole of Europe in the period 1965-2015. The RRP is well established in Europe with at least 90 breeding populations in 10 countries, and a total population size of at least 85,000 birds as of 2015. For Western Europe, long-term demographic data indicate the species has grown considerably in number, although some populations have failed to persist. Data is scarce for countries in Central, Eastern and Northern Europe. Our synthesis reveals a positive demographic trend across Europe, although locally, some populations appear to have reached carrying capacity. Further research is needed to understand the mechanisms underlying RRP population growth in Europe, and methods amenable to citizen-scientists are urgently required to monitor population and range dynamics. Keywords: Demography, Europe, Invasive alien species, Parrots, Population, Psittaciformes. © Pârâu et al. ; Licensee Bentham Open. Many species are transported and released to areas beyond their natural distribution ranges by direct or indirect human activities [1Richardson DM, Ed. Fifty Years of Invasion Ecology: the legacy of Charles Elton. Oxford: Blackwell Publishing Ltd. Hoboken 2010. [http://dx.doi.org/10.1002/9781444329988] ]. Some of these species have become invasive in their new environments and therefore pose threats to biodiversity, economy and human wellbeing [2Vitousek PM, D’Antonio CM, Loope LL, Rejmanek M, Westbrooks R. Introduced species: A significant components of human-caused global change. N Z J Ecol 1997; 21: 1-16. [http://dx.doi.org/10.1890/02-0571] ]. Europe has witnessed the arrival of many alien species, some of which have subsequently established and formed invasive populations [3Chiron F, Shirley S, Kark S. Human-related processes drive the richness of exotic birds in Europe. Proc Biol Sci 2009; 276: 47-53. [http://dx.doi.org/10.1098/rspb.2008.0994] [PMID: 18782749] -5Handbook of Alien Species in Europe. Dordrecht: Springer 2009.]. The most complete inventory to date - the European Alien Species Information Network [6Katsanevakis S, Bogucarskis K, Gatto F, Vandekerkhove J, Deriu I, Cardoso AC. Building the European Alien Species Information Network (EASIN): a novel approach for the exploration of distributed alien species data. Bio Invasions Rec 2012; 1: 235-45. [http://dx.doi.org/10.3391/bir.2012.1.4.01] ] - offers information for 12,240 terrestrial alien species, including species native to one region of Europe but alien to another. Vascular plants account for the majority of the records, followed by invertebrates [6Katsanevakis S, Bogucarskis K, Gatto F, Vandekerkhove J, Deriu I, Cardoso AC. Building the European Alien Species Information Network (EASIN): a novel approach for the exploration of distributed alien species data. Bio Invasions Rec 2012; 1: 235-45. [http://dx.doi.org/10.3391/bir.2012.1.4.01] ]. The same source indicates that 342 alien bird species have been recorded in the wild in Europe, 74 of which are considered established. To date, 53 species of alien parrots have been found in the wild in Europe, of which 12 species have established self-sustaining populations within Europe [6Katsanevakis S, Bogucarskis K, Gatto F, Vandekerkhove J, Deriu I, Cardoso AC. Building the European Alien Species Information Network (EASIN): a novel approach for the exploration of distributed alien species data. Bio Invasions Rec 2012; 1: 235-45. [http://dx.doi.org/10.3391/bir.2012.1.4.01] ]. The Rose-ringed Parakeet Psittacula krameri (Scopoli, 1769) (hereafter RRP) is the most abundant parrot found in Europe and around the Mediterranean, with large populations in several countries [7Braun M. Die Bestandssituation des Halsbandsittichs Psittacula krameri in der Rhein-Neckar-Region (Baden-Württemberg, Rheinland-Pfalz,Hessen), 1962-2008, im Kontext der gesamteuropäischen Verbreitung. Vogelwelt 2009; 130: 77-89., 8Strubbe D, Matthysen E. Establishment success of invasive ringnecked and monk parakeets in Europe. J Biogeogr 2009; 36: 2264-78. [http://dx.doi.org/10.1111/j.1365-2699.2009.02177.x] ]. Furthermore, it is listed as one of the worst 100 alien species in Europe [5Handbook of Alien Species in Europe. Dordrecht: Springer 2009.]. Evidence ranges from both direct [9Strubbe D, Matthysen E. Invasive ring-necked parakeets Psittacula krameri in Belgium : habitat selection and impact on native birds. Ecography (Cop) 2007; 30: 578-88. [http://dx.doi.org/10.1111/j.0906-7590.2007.05096.x] -11Dodaro G, Battisti C. Rose-ringed parakeet (Psittacula krameri) and starling (Sturnus vulgaris) syntopics in a Mediterranean urban park : evidence for competition in nest-site selection? Belg J Zool 2014; 144: 5-14.] and indirect [12Orchan Y, Chiron F, Shwartz A, Kark S. The complex interaction network among multiple invasive bird species in a cavity-nesting community. Biol Invasions 2012; 15: 429-45. [http://dx.doi.org/10.1007/s10530-012-0298-6] ] negative impacts on local cavity nesters, aggression towards animals in the vicinity of the nest [13Hernández-Brito D, Luna A, Carrete M, Tella JL. Alien rose-ringed parakeets (Psittacula krameri) attack black rats (Rattus rattus) sometimes resulting in death. Hystrix 2014; 25: 121-3., 14Menchetti M, Scalera R, Mori E. First record of a possibly overlooked impact by alien parrots on a bat (Nyctalus leisleri). Hystrix 2014; 25: 61-2. [http://dx.doi.org/10.4404/hystrix-25.1-9989] ], competition for food sources [15Peck HL, Pringle HE, Marshall HH, Owens IP, Lord AM. Experimental evidence of impacts of an invasive parakeet on foraging behavior of native birds. Behav Ecol 2014; 25: 582-90. [http://dx.doi.org/10.1093/beheco/aru025] [PMID: 24822022] ] and transmission of macroparasites [16Mori E, Ancillotto L, Groombridge J, Howard T, Smith VS, Menchetti M. Macroparasites of introduced parakeets in Italy: a possible role for parasite-mediated competition. Parasitol Res 2015; 114: 3277-81. [http://dx.doi.org/10.1007/s00436-015-4548-2] ]. Nonetheless, evidence also exists for native species benefiting from the introduction of the RRP e.g. more available nest cavities [17Franz D, Krause T, Simon L. Zur Verbreitung und Biologie des Halsbandsittichs Psittacula krameri am Oberrhein (Rheinland-Pfalz) Distribution and biology of Rose-ringed Parakeets Psittacula krameri in the Upper Rhine valley. Rhineland-Palatinate: Fauna Flora Rheinland-Pfalz 2002; 28: pp. 237-51.] and reduced predator pressure through parakeets’ mobbing behaviour towards perceived predators [18Hernández-Brito D, Carrete M, Popa-Lisseanu AG, Ibáñez C, Tella JL. Crowding in the city: losing and winning competitors of an invasive bird. PLoS One 2014; 9: e100593. [http://dx.doi.org/10.1371/journal.pone.0100593] [PMID: 24945439] ]. Other studies failed to find evidence of RRP impacts [19Czajka C, Braun MP, Wink M. Resource Use by Non-Native Ring-Necked Parakeets (Psittacula krameri) and Native Starlings (Sturnus vulgaris) in Central Europe. Open Ornithol J 2011; 4: 17-22.]. Although avian invaders may locally have severe impacts on biodiversity, economy and human (social) wellbeing, how their impacts compare to those of other invasive taxa is subject to debate [20Blackburn TM, Lockwood JL, Cassey P. Avian Invasions: The Ecology and Evolution of Exotic Birds. USA: Oxford University Press 2009.-22Strubbe D, Shwartz A, Chiron F. Concerns regarding the scientific evidence informing impact risk assessment and management recommendations for invasive birds. Biol Conserv 2011; 144: 2112-8. [http://dx.doi.org/10.1016/j.biocon.2011.05.001] ]. Similar disagreement exists concerning RRP impacts, and this is most probably at least partly fueled by our still limited knowledge on their demography across Europe. The RRP, native to Asia and Sub-Saharan Africa [23Forshaw JM. Parrots of the World. 2nd ed. London: Princeton University Press 2010. [http://dx.doi.org/10.1515/9781400836208] ], has been a popular cage bird for many centuries and thousands of individuals have been imported to Europe [24Jackson H, Strubbe D, Tollington S, Prys-Jones R, Matthysen E, Groombridge JJ. Ancestral origins and invasion pathways in a globally invasive bird correlate with climate and influences from bird trade. Mol Ecol 2015; 24: 4269-85. [http://dx.doi.org/10.1111/mec.13307] [PMID: 26172573] ] until July 2007, when the European Union banned further imports in its member countries [25Commission Regulation (EC) No 318/2007 of 23 March 2007 laying down animal health conditions for imports of certain birds into the Community and the quarantine conditions thereof. Official J Eur Union 2007.]. Both accidental escapes and deliberate releases have led to the formation of growing and established populations, beginning with the late 1960’s. By 2009, more than 65 wild populations were reported present across Europe [8Strubbe D, Matthysen E. Establishment success of invasive ringnecked and monk parakeets in Europe. J Biogeogr 2009; 36: 2264-78. [http://dx.doi.org/10.1111/j.1365-2699.2009.02177.x] ]. 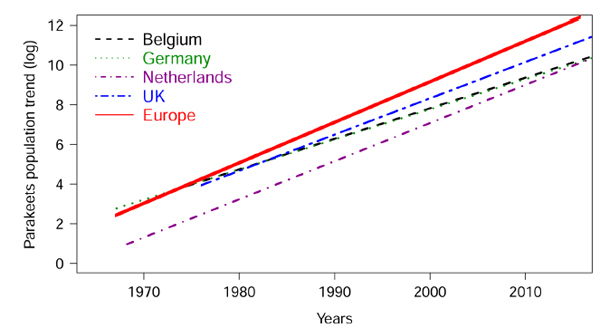 Historical datasets on demographic trends of RRP populations going back as far as 1968 are available from several countries with large populations - the UK, the Netherlands, Belgium and Germany - but these data have not yet been formally integrated. Here, we evaluated the existing literature relating to RRP status in Europe (i.e. published papers, regional bird-atlases, and grey literature), gathered all known data on RRPs counted at their communal roosting sites, and contacted European researchers, academics, citizen-science coordinators, birding organizations and regional birdwatchers, in order to collate and update available information on RRP populations in 37 countries in Europe. Introduced birds provide a unique perspective on several evolutionary and ecological aspects as their invasion histories have often been well documented [20Blackburn TM, Lockwood JL, Cassey P. Avian Invasions: The Ecology and Evolution of Exotic Birds. USA: Oxford University Press 2009.]. Given the pervasive influence of historical events (such as propagule pressure) on invasion success [26Simberloff D. The role of propagule pressure in biological invasions. Annu Rev Ecol Evol Syst 2009; 204: 81-102. [http://dx.doi.org/10.1146/annurev.ecolsys.110308.120304] , 27Blackburn TM, Lockwood JL, Cassey P. The influence of numbers on invasion success. Mol Ecol 2015; 24: 1942-53. [http://dx.doi.org/10.1111/mec.13075] ], such information is critical for advancing the field of invasion biology. Although the RRP is probably one of the best documented alien vertebrates in Europe, the wealth of historical and current datasets on its invasion success and population demography have not yet been systematically collated and analyzed. The aim of this paper is therefore to bring together, verify and make available this valuable information, as the RRP invasion of Europe present a unique opportunity to study alien species invasion success. We searched for relevant literature on the distribution and demography of RRP in Europe using the following sources: (1) Web of Science, (2) Google Scholar, (3) Parrot Research Group - Google Drive library, (4) ParrotNet - Google Drive library and (5) Google. The Parrot Research Group (a Working Group of the International Ornithologists’ Union: http://psittaciformes.internationalornithology.org/) and ParrotNet (a European Cooperation in Science and Technology (COST) Action: http://www.kent.ac.uk/parrotnet/) libraries currently represent the most complete literature databases on Psittaciformes, at worldwide and European level, respectively. These databases are maintained by experts in the field. We used the following keywords: “Rose ringed Parakeet” AND “Europe”, “Ring necked Parakeet” AND “Europe”, “Psittacula krameri” AND “Europe”. To target a specific population from a given country we used the same keywords, but replaced the word "Europe" with the country's name in English e.g. “Rose ringed Parakeet” AND “Germany”. To obtain information on a regional population, we replaced "Europe" with the specific name of the location e.g. “Psittacula krameri” AND “Paris”. Furthermore, we searched using the above-mentioned keywords translated into the corresponding local language e.g. “Halsbandsittich” AND “Deutschland”, “Perruche à collier” AND “Paris”. Additionally, we reviewed 12 bird atlases (published between 1976 and 2014) from Austria, Germany, the Netherlands, Portugal, Spain and the United Kingdom. In total, we extracted data from 34 literature items (supplementary material 1: Table S1). We searched the literature between August 2014 and September 2015. To offer a complete assessment of demography and distribution of RRP in Europe, we included countries in the European continent and its islands, including Belarus, Ukraine and Turkey but excluded the European part of Russia. We therefore collated data for a total of 37 countries (see Table 1, supplementary material 2: Table S2). For all information sources i.e. literature, databases and local bird experts, we considered a RRP population as a group of a minimum of 10 birds, as this threshold represent a high chance that both males and females are present. Strubbe & Matthysen (2011) [28Strubbe D, Matthysen E. Short communication A radiotelemetry study of habitat use by the exotic Ring-necked Parakeet Psittacula krameri in Belgium. Ibis 2011; 153: 180-4.] found that RRPs breeding in Brussels covered distances up to ±9km between roosting and nesting sites, and we therefore considered 10 kilometers the minimum distance required for two distinct groups of birds to be separate populations (although most populations were considerable further away from each other). The ‘distance’ criterion was used only when historical (literature) records did not clearly indicate separate introduction events. A population was considered established if it was present for a minimum of 10 years, with evidence of breeding persisting until present. We further defined a failed population as one for which no presence data is available for the last 5 years, or when no other information is available since the last source mentioned the respective population as failed. Finally, a population was described as unclear when evidence of breeding is lacking for the last 5 years. We identified RRP observations available on the ornitho bird sightings platform for the following countries: Austria (http://www.ornitho.at), France (http://www.ornitho.fr), Germany (http://www.ornitho.de), Italy (http://www.ornitho.it), Spain (Catalonia) (http://www.ornitho.cat) and Switzerland (http://www.ornitho.cat). Despite searching the databases as a registered user, for Austria, France, Germany and Italy, our inquiry was restricted only to observations from the past 15 days. This temporal restriction is linked to the contribution of the user i.e. number of submitted bird observations. For Spain and Switzerland we had access to the full dataset: from 1976 and 1903, respectively. Furthermore, we collated data from the map of RRP observations from the European Monitoring Center of ParrotNet (ECOST ACTION ES1304), available at http://www.kent.ac.uk/parrotnet/map.html. This map contains observations from both eBird (http://ebird.org/content/ebird/) and GBIF - Global Biodiversity Information Facility (www.gbif.org/) dating from 1967 until 2014. We searched the ornitho platform and the Parrot Net map three times: on April 10, May 26 and June 10, 2015. These databases also acted as a tool to double-check the information retrieved from the literature search. We contacted by email 91 regional bird experts from 37 European countries. For each country - if possible, at least two persons were contacted to obtain independent information on the status of RRP. We obtained these contacts from the list of delegates of the European Bird Census Council (EBCC), available at http://www.ebcc.info/who.html (accessed 4 October 2014). Additional contacts were obtained from BirdLife International’s Address Booklet 2013 (Europe and Central Asia), available at http://www.birdlife.ch/de/content/downloads-0 (accessed 12 October 2014), and the remaining were personal contacts (n= 56). The email sent contained four questions asking: (1) if the RRP is present in their respective country? If yes, (2) how big is the population and (3) when was it established (to the best of their knowledge)? Finally, (4) we asked the local bird experts if any particular extra information is available relating to population growth, distribution and spread. Emails were sent out between September 2014 and July 2015. Many parakeet species, including RRP, spend the night at communal roost sites (typically a group of trees), and counting the number of parakeets arriving at such sites is a reliable way to estimate local population size (when counts are conducted outside of the breeding season) [29Casagrande DG, Beissinger SR. Evaluation of four methods for estimating parrot population size. Condor 1997; 99: 445-57. [http://dx.doi.org/10.2307/1369951] ]. By searching the literature and contacting the regional experts (see above), we were able to find roost count data for the following European cities: Lille-Roubaix, Marseille, Nancy, Roissy, Wissous (France), Wiesbaden-Mainz and Rhine-Neckar areas (Germany), Follonica, Florence and Rome (Italy). These roost counts were conducted either by citizen-scientists, as part of individual research programs (e.g. Master or PhD thesis) or through (government-mandated) longer-term monitoring programs. Counts conducted during the breeding season were excluded for estimating population sizes in this study. Exact roost count protocols varied among study sites depending on local circumstances such as ease of observation of the roost site, number of citizen-scientists available and parakeet population size (smaller populations are less difficult to count) but, in general, population sizes are obtained by simply summing (estimates of) the numbers of parakeets arriving at the roost site. Small populations allow parakeets to be counted individually while for larger populations, size estimates for arriving flocks are applied. While such (rather small) differences in protocols and observer experience may influence the accuracy of individual counts, most if not all of the above-mentioned parakeet populations have been counted, often for years, by skilled birders and ornithologists, and we therefore argue these roost counts accurately reflect population trends and overall population sizes (but see below for a discussion on the applicability of roost counts for large and widespread RRP populations). Based on the list published in Strubbe & Matthysen (2009) [8Strubbe D, Matthysen E. Establishment success of invasive ringnecked and monk parakeets in Europe. J Biogeogr 2009; 36: 2264-78. [http://dx.doi.org/10.1111/j.1365-2699.2009.02177.x] ], we generated a complete list of RRP populations in Europe, using data from the above-mentioned sources. We evaluated population size and growth per specific population, country and the whole of Europe from 1965 until 2015. As not every population was counted on a yearly basis, we used the most recent population estimate available for individual populations (e.g. if count data were available for 2011 and 2013 but not 2012, the latter year was assigned the 2011 population size). The literature search resulted in an initial suite of documents from which relevant literature (i.e. containing demographic aspects and RRP distribution in Europe) were selected (n=22) (supplementary material 1: Table S1). Most of the items were journal papers (n=13), but also PhD and MSc thesis (n=4), breeding bird reports (n=3), one paper in conference proceedings and one poster. Just one publication evaluated RRP populations across the whole of Europe [8Strubbe D, Matthysen E. Establishment success of invasive ringnecked and monk parakeets in Europe. J Biogeogr 2009; 36: 2264-78. Data obtained from the ornitho platform revealed 3 populations additional to those highlighted in the literature search, all in Spain (Castelló d'Empuries, Manresa, Reus). For all databases we only mention the cases that were not already found in the literature search. We received 77 responses from local bird experts (85% response rate), for a total of 37 European countries (supplementary material 2: Table S2). Although this expert consultation did not lead to the discovery of hitherto unknown parakeet populations, in all cases, experts confirmed the status (i.e. established or failed) of RRP populations detected through the other search methods applied. Roost count results are made available in supplementary material 2: Table S2. We collected information for a total number of 154 RRP populations in 37 countries (Table 1), of which 127 populations from 10 countries were mentioned in the first list of European populations published [8Strubbe D, Matthysen E. Establishment success of invasive ringnecked and monk parakeets in Europe. J Biogeogr 2009; 36: 2264-78. [http://dx.doi.org/10.1111/j.1365-2699.2009.02177.x] ]. Furthermore, we report the status of RRP in 27 of the 37 countries, for which no data were previously published (supplementary material 2: Table S2). Our combined data show that the RRP has reached a lower estimate of 85,120 total individuals in Europe (Table 2, supplementary material 3: Table S3). The United Kingdom, Germany, Belgium and the Netherlands have the largest populations, with at least 31,000, 10,960, 10,800 and 10,100 individuals, respectively. Italy and France also have important populations of 9,170 and 7,250 parakeets, respectively. Smaller, but growing populations are found in Spain, Turkey, Greece, and Portugal, with 3,000, 1,040, 1,000 and 800 birds, respectively. Currently, these 10 countries hold the vast majority of the European RRP population (Fig. 1 ), which has grown considerably in the last 40 years (Figs. 2 , 3 ). It should be noted that all these estimates are lower estimates. Complete list of Rose-ringed Parakeet populations in Europe. Rose-ringed parakeet population size (1965-2015) from Belgium, Germany, the Netherlands and the United Kingdom (countries with >10,000 birds) versus total European population (10 countries, including the four listed here). Left Y-axis indicates number of birds per country, while right Y-axis represents the total European values (red squares). Estimated numbers of Rose-ringed Parakeets per country and for Europe. Rose-ringed parakeet population size (1965-2015, log transformed data) from Belgium, Germany, the Netherlands and the United Kingdom (countries with >10,000 birds) versus total European population (10 countries, including the four listed here). Only trendlines shown . The total European RRP population has reached a minimum of 85,120 individuals in 2015. More than 40 years after establishing their first wild populations in Europe, in 2015 RRPs have a total of 154 populations in 10 European countries, of which 90 are established, 35 are failed and a further 29 have an unclear status. Parakeets are most abundant in large metropolitan areas such as Greater London [30Balmer DE, Gillings S, Caffrey BJ, Swann RL, Downie IS, Fuller RJ. Bird Atlas 2007-2011: The Breeding and Wintering Birds of Britain and Ireland. Thetford: BTO Books 2013.-32Pithon JA. The status and ecology of the ring-necked parakeet Psittacula krameri in Great Britain. PhD Thesis. ], the Randstad in Western Netherlands [33van Kleunen A, Kampichler C, Sierdsema H. De verspreiding van Halsbandparkiet en andere in het wild voorkomende papegaaiachtigen (Psittaciformes) in Nederland. In: Sovon-rapport 2014/31. Nederland, Nijmegen: Sovon Vogelonderzoek 2014., 34Klaassen O. Halsbandparkieten in Nederland in de winter van 2013/14 In: Sovon-rapport 2014/16. Nederland, Nijmegen: Sovon Vogelonderzoek 2014. ], Brussels [10Strubbe D, Matthysen E, Graham CH. Assessing the potential impact of invasive ring-necked parakeets Psittacula krameri on native nuthatches Sitta europeae in Belgium. J Appl Ecol 2010; 47: 549-57. [http://dx.doi.org/10.1111/j.1365-2664.2010.01808.x] , 35Weiserbs A. Especes invasives: Le cas des Psittacides en Belgique. Incidences, evaluation des risques et eventail de mesures. Aves 2010; 47: 21-35. ], Paris [36Clergeau P. L’invasion de l’espèce exotique, la Perruche à collier Psittacula krameri. Report for Conseil Général des Hauts-de-Seine. 2014. ], the Rhine-Neckar region [7Braun M. Die Bestandssituation des Halsbandsittichs Psittacula krameri in der Rhein-Neckar-Region (Baden-Württemberg, Rheinland-Pfalz,Hessen), 1962-2008, im Kontext der gesamteuropäischen Verbreitung. Vogelwelt 2009; 130: 77-89., 37Gedeon K, Grüneberg C, Mitschke A, et al. Atlas Deutscher Brutvogelarten (Atlas of German Breeding Birds). Münster: Stiftung Vogelmonitoring Deutschland und Dachverband Deutscher Avifaunisten 2014.] and Rome [38Fraticelli F. The rose-ringed parakeet Psittacula krameri in a urban park : demographic trend, interspecific relationships and feeding preferences (Rome, central Italy). Avocetta 2014; 1-6.]. The European RRP population has increased considerably over the last 40 years. This situation is exemplified by the British population, which is now by far the largest population present in Europe, totaling an estimated 8,600 breeding pairs and c. 31,000 individuals [31Peck HL. Investigating ecological impacts of the non-native population of Rose-ringed parakeets (Psittacula krameri) in the UK. PhD thesis. Imperial College London 2013., 39Musgrove A, Aebischer N, Eaton M, et al. Population estimates of birds in Great Britain and the United Kingdom. Br Birds 2013; 106: 64-100.]. The UK population has not only strongly increased in size, but has also shown a strong geographical spread, as Balmer et al. (2013) [30Balmer DE, Gillings S, Caffrey BJ, Swann RL, Downie IS, Fuller RJ. Bird Atlas 2007-2011: The Breeding and Wintering Birds of Britain and Ireland. Thetford: BTO Books 2013.] mention that the RRP has increased its breeding range by 4400% since 1968, making it the 3rd most rapidly increasing species after Cetti's Warbler (Cettia cetti) and Mediterranean Gull (Ichtyaetus melanocephalus). The UK is also home to the largest roost ever reported - 15,000 birds - at Hersham, Greater London [31Peck HL. Investigating ecological impacts of the non-native population of Rose-ringed parakeets (Psittacula krameri) in the UK. PhD thesis. Imperial College London 2013.]. In 1986 there were approximately 1,000 birds in the UK [40Lack P. The Atlas of Wintering Birds in Britain and Ireland. T. & A.D. Poyser. Calton 1986.]. In the year 1996 a simultaneous national roost count resulted in 1,508 birds [41Pithon JA, Dytham C. Census of the British Ring-necked Parakeet Psittacula krameri population by simultaneous counts of roosts. Bird Study 1999; 46: 37-41. [http://dx.doi.org/10.1080/00063659909461121] ], 1,880 in 1997 and 2,060 parakeets in 1998 [42Pithon JA, Dytham C. Distribution and population development of introduced Ring-necked Parakeets Psittacula krameri in Britain between 1983 and 1998: Of the three subpopulations, only the one west of London was increasing, with little spread. Bird Study 2002; 49: 110-7. [http://dx.doi.org/10.1080/00063650209461254] ]. In 2002 an estimated 5,500 birds were present at the known roost sites [43Butler CJ. Population Biology of the Introduced Rose-ringed Parakeet Psittacula krameri in the UK. PhD thesis;. University of Oxford 2003.] and in 2007 the entire population was evaluated at 20,000 individuals [44Fletcher M, Askew N. Review of the status, ecology and likely future spread of parakeets in England 2007.]. The most recent study [31Peck HL. Investigating ecological impacts of the non-native population of Rose-ringed parakeets (Psittacula krameri) in the UK. PhD thesis. Imperial College London 2013.] indicates a maximum number of parakeets in 2011, of 32,167 individuals, while the following year only 29,133 birds were counted. Furthermore, the same study suggests that both the Greater London and Ramsgate (Canterbury) RRP population might at least locally have reached carrying capacity, with bird numbers being stable between 2010 and 2012. In the Netherlands, RRPs have extended their distribution by 239% since 1998 and the number of breeding pairs increased by 1582% [33van Kleunen A, Kampichler C, Sierdsema H. De verspreiding van Halsbandparkiet en andere in het wild voorkomende papegaaiachtigen (Psittaciformes) in Nederland. In: Sovon-rapport 2014/31. Nederland, Nijmegen: Sovon Vogelonderzoek 2014.]. Almost the entire RRP population is found in the Western part of the country, the so-called Randstad conurbation. This region is considered a fused breeding area, where independently established RRP populations have come into contact with each other through range expansion, as indicated by a 2014 study [33van Kleunen A, Kampichler C, Sierdsema H. De verspreiding van Halsbandparkiet en andere in het wild voorkomende papegaaiachtigen (Psittaciformes) in Nederland. In: Sovon-rapport 2014/31. Nederland, Nijmegen: Sovon Vogelonderzoek 2014.]. Small numbers of breeding territories were recently recorded in Middelburg, Eindhoven, Maastricht, Zwolle, Groningen and Bolsward. In 1999, the Dutch population was estimated at c. 1,000 birds of which 150 were breeding pairs [45Bijlsma RG, Hustings F, Camphuysen CJ. Algemene en schaarse vogels van Nederland (Avifauna van Nederland 2)/ Common and scarce birds of the Netherlands. Haarlem/ Utrecht 2001., 46Hustings F, Vergeer JW. Halsbandparkiet Psittacula krameri SOVON Vogelonderzoek Nederland Atlas van de Nederlandse Broedvogels 1998-2000 Nederlandse Fauna 5. Leiden: Nationaal Natuurhistorisch Museum Naturalis/KNNV Uitgeverij & European Invertebrate Survey-Nederland 2002; pp. 268-9.]. However, in 2004 simultaneous winter roost counts revealed a total number of 5,400 RRPs. In 2010, 9,800 individuals were recorded at roost sites and 9,400 in 2011. Maximum national population size was recorded in 2012, with 11,700 individuals, while in 2013 roost counts revealed 10,100 birds across the country [34Klaassen O. Halsbandparkieten in Nederland in de winter van 2013/14 In: Sovon-rapport 2014/16. Nederland, Nijmegen: Sovon Vogelonderzoek 2014.]. These data show a significant increase from 1999 until present, with the most recent counts suggesting a possible stabilization of the population. The Belgian population followed a similar growth pattern: since 1995, when the total population was estimated at 1,000 individuals, the number of birds increased to approximately 9,000 in 2010 [35Weiserbs A. Especes invasives: Le cas des Psittacides en Belgique. Incidences, evaluation des risques et eventail de mesures. Aves 2010; 47: 21-35., 47Synaeve A. Parkietentelling. Passer 2010; p. 4.] and 10,800 in 2015 (Alain Paquet pers. comm.). In the last 5 years, the Brussels population had dispersed to the cities of Ghent, Antwerp and Sint-Niklaas, and smaller populations (<100 birds) are increasingly reported from across the country. Of the 7,250 RRP counted in France, approximately 5,000 are found in Île-de-France [36Clergeau P. L’invasion de l’espèce exotique, la Perruche à collier Psittacula krameri. Report for Conseil Général des Hauts-de-Seine. 2014.] and another ±1,000 individuals in the Lille-Roubaix area. Other important breeding locations are on the Mediterranean coast. The number of birds increased considerably over the last 10 years. The Île-de-France population alone, increased from 500 individuals in 2007, to over 1,100 in 2009 and to more than 5,000 at present [36Clergeau P. L’invasion de l’espèce exotique, la Perruche à collier Psittacula krameri. Report for Conseil Général des Hauts-de-Seine. 2014., 48Clergeau P, Vergnes A, Delanoue RR. La Perruche à collier Psittacula krameri introduite en Île-de-France: distribution et régime alimentaire. Alauda 2009; 77: 121-32., 49Clergeau P, Leroy O, Lenancker P. Dynamique de population de la Perruche à collier Psittacula krameri introduite en Île-de-France. Alauda 2015; 83: 165-74.]. In Germany, 10,960 RRPs were estimated in the areas around the Rhine and Neckar rivers [50Wink M, Dietzen C, Gießing B. Die Vögel des Rheinlandes Atlas zur Brut und Wintervogelverbreitung 1990-2000. Beiträge zur Avifauna Nordrhein-Westfalens; 36; 2005., 51Grüneberg C, Sudmann SR, Weiss J, et al. Die Brutvögel Nordrhein-Westfalens. In: NWO&LANUV (Hrsg). LWL-Museum für Naturkunde, Münster 2013.]. In 2002, the national population was estimated at 4,000 birds [17Franz D, Krause T, Simon L. Zur Verbreitung und Biologie des Halsbandsittichs Psittacula krameri am Oberrhein (Rheinland-Pfalz) Distribution and biology of Rose-ringed Parakeets Psittacula krameri in the Upper Rhine valley. Rhineland-Palatinate: Fauna Flora Rheinland-Pfalz 2002; 28: pp. 237-51., 52Braun M. Neozoen in urbanen Habitaten: Ökologie und Nischenexpansion des Halsbandsittichs. Diploma thesis. Philipps-Universität Marburg 2004. ], with an increase to 7,500 birds in 2009 [7Braun M. Die Bestandssituation des Halsbandsittichs Psittacula krameri in der Rhein-Neckar-Region (Baden-Württemberg, Rheinland-Pfalz,Hessen), 1962-2008, im Kontext der gesamteuropäischen Verbreitung. Vogelwelt 2009; 130: 77-89.]. Presently, the populations in Heidelberg, Mannheim, Ludwigshafen and Wiesbaden are still increasing (as determined using data from this study, see Figs. 2 , 3 ). RRPs are distributed in the Northern and Central part of Italy, along the coast and on the islands - Sardinia and Sicily. Italy has an estimated total of 9,170 parakeets, with Rome and Palermo home to 5,500 and 1,000 birds, respectively. In Spain the total estimated population is about 3,000 individuals, including populations on Spanish islands (Balearic and Canary Islands). Seville, in Andalucía, holds almost half of the national population with 1,400 birds, an increase from 1,100 in 2011 [18Hernández-Brito D, Carrete M, Popa-Lisseanu AG, Ibáñez C, Tella JL. Crowding in the city: losing and winning competitors of an invasive bird. PLoS One 2014; 9: e100593. [http://dx.doi.org/10.1371/journal.pone.0100593] [PMID: 24945439] ]. Greece has a lower estimate of 1,000 parakeets, several hundred of which are found in the urban parks of Athens. In Portugal, most of the birds are confined to Lisbon, with a small population in Porto as well. The entire Portuguese RRP population is estimated to be at least 800 individuals. In Turkey, the cities of İstanbul, Ankara, İzmir and Antalya hold a total of 1,040 parakeets within their urban parks. Breeding events have been recorded in Adana and Șanlıurfa as well [53Akyıldırım B, Arslan M. Türkiye’ye Yerleşen Egzotik Kuş Türleri: Yeşil papağan (Psittacula krameri) ve İskender papağanı (Psittacula eupatria) 2009.]. Countries in Eastern Europe (Belarus, Bulgaria, Moldova, Romania, Serbia, Ukraine), Central Europe (Bosnia-Herzegovina, Croatia, Czech Republic, Hungary, Poland, Slovakia, Slovenia) and Northern Europe (Denmark, Finland, Norway, Sweden), as well as the Baltic states (Estonia, Latvia, Lithuania) have only rare escaped birds or failed breeding attempts. These results support the assertion of Chiron et al. (2010) [54Chiron F, Shirley SM, Kark S. Behind the Iron Curtain: Socio-economic and political factors shaped exotic bird introductions into Europe. Biol Conserv 2010; 143: 351-6. [http://dx.doi.org/10.1016/j.biocon.2009.10.021] ] that the prevalence of exotic species is lower in ex-communist countries than countries within Western Europe. According to Chiron et al. (2010), the lower prevalence of invasive birds in these countries is due to associated trade patterns and volumes. Data obtained from the CITES Trade Database [55CITES trade statistics derived from the CITES Trade Database. 2014.] reveals 231,048 RRPs were imported in Europe from 1981 (earliest data available) until 2007 (European Commission ban on exotic species trade). However, of these imports, 215,000 were in the 10 countries (Western Europe, except Greece and Turkey) which currently hold the vast majority of wild RRPs in Europe (see Table 2), while the other 27 states included in our study (see Table 1) have a combined total of only 15,600 RRPs imported. Furthermore, our results are in concordance with the assertions made by Strubbe & Matthysen (2009) [8Strubbe D, Matthysen E. Establishment success of invasive ringnecked and monk parakeets in Europe. J Biogeogr 2009; 36: 2264-78. [http://dx.doi.org/10.1111/j.1365-2699.2009.02177.x] ] and by Shwartz et al. (2009) [56Shwartz A, Strubbe D, Butler CJ, Matthysen E, Kark S. The effect of enemy-release and climate conditions on invasive birds: a regional test using the rose-ringed parakeet (Psittacula krameri) as a case study. Divers Distrib 2009; 15: 310-8. [http://dx.doi.org/10.1111/j.1472-4642.2008.00538.x] ]. Cold temperatures are known to negatively influence parakeet invasion success, and large parts of Eastern Europe are characterized by continental climates with strong and severe winters, potentially limiting the establishment and spread of RRP in these countries. The current study offers evidence that RRP numbers are increasing throughout Europe, with many populations growing strongly, although our data do suggest that several of the earliest established and currently largest populations appear to be increasing at a slower rate (e.g. the Netherlands, Belgium and Germany). In regard to countries with large (>10,000) RRP numbers, it has become logistically difficult to count the parakeets. As most data is obtained from roost counts, it is now problematic to mobilize volunteers and to organize simultaneous counts across large areas. For instance, it was relatively easy to count RRPs in Belgium until 2010, because the entire national population was roosting in two places, both in Brussels. However, the national count in 2015 involved 13 roost sites spread across the country (Alain Paquet - AVES & Gerald Driessens - Natuurpunt pers. comm.). Hence, we stress that the apparent slow increase of large populations might have three causes: (i) the population has reached its carrying capacity in the area, (ii) the population is still growing and expanding but we are no longer able to measure it or (iii) a combination of the first two. For this reason, we are cautious in interpreting demographic patterns of large populations and we advocate that other monitoring techniques should be considered: e.g. common bird monitoring techniques such as, for example, network of points or transect counts. Butler (2003) [43Butler CJ. Population Biology of the Introduced Rose-ringed Parakeet Psittacula krameri in the UK. PhD thesis;. University of Oxford 2003.] extrapolated observed population growth to conclude that by 2026 the Greater London population could exceed 100,000 RRPs. Based on climate conditions and anthropogenic modification of habitats, Strubbe et al. (2015) [57Strubbe D, Jackson H, Groombridge J, Matthysen E. Invasion success of a global avian invader is explained by within-taxon niche structure and association with humans in the native range. Divers Distrib 2015; 1-11. [http://dx.doi.org/10.1111/ddi.12325] ] found that across the UK, there is ample suitable habitat for the parakeets to expand their distribution. The most recent (2012) UK RRP count yielded a total of 29,133 parakeets [31Peck HL. Investigating ecological impacts of the non-native population of Rose-ringed parakeets (Psittacula krameri) in the UK. PhD thesis. Imperial College London 2013. ], which is close to the 28,057 birds predicted by Butler’s (2003) [43Butler CJ. Population Biology of the Introduced Rose-ringed Parakeet Psittacula krameri in the UK. PhD thesis;. University of Oxford 2003.] model, suggesting that the UK population has, at least until 2012, grown exponentially. The most recent (2013) British Bird Atlas [30Balmer DE, Gillings S, Caffrey BJ, Swann RL, Downie IS, Fuller RJ. Bird Atlas 2007-2011: The Breeding and Wintering Birds of Britain and Ireland. Thetford: BTO Books 2013.] does suggest an ongoing range expansion, away from the Greater London area. In Belgium, based on habitat and land-use maps, Strubbe & Matthysen (2009) [58Strubbe D, Matthysen E. Predicting the potential distribution of invasive ring-necked parakeets Psittacula krameri in northern Belgium using an ecological niche modelling approach. Biol Invasions 2009; 11: 497-513. [http://dx.doi.org/10.1007/s10530-008-9266-6] ] predicted there is abundant suitable habitat for RRPs outside of Brussels core distribution area potentially harboring up to 22,000 breeding pairs [10Strubbe D, Matthysen E, Graham CH. Assessing the potential impact of invasive ring-necked parakeets Psittacula krameri on native nuthatches Sitta europeae in Belgium. J Appl Ecol 2010; 47: 549-57. [http://dx.doi.org/10.1111/j.1365-2664.2010.01808.x] ]. In recent years, citizen-science data ( http://www.waarnemingen.be) suggest a considerable range expansion of RRPs towards other urbanized areas across Belgium. Recent roost counts (2015) yielded 10,800 parakeets compared to a maximum of 9,460 birds in 2009. While this may seem a relatively small increase over the course of six years, the larger number of roosts spread across the country poses logistical difficulties such as detecting all roosts and motivating sufficient volunteers, potentially leading to underestimated population sizes. Peck (2013) [31Peck HL. Investigating ecological impacts of the non-native population of Rose-ringed parakeets (Psittacula krameri) in the UK. PhD thesis. Imperial College London 2013.] reported this to be the case in the UK as well, calling into question whether synchronous roost counts are the most suitable method for tracking the population development of large and widespread alien parakeet populations. Whereas at the start of the invasion, individual RRP populations were easily discernible, the situation has become much more complex now. Several larger populations have expanded beyond the urban centers in which they were introduced, giving rise to new (probably partially connected) populations. In other cases, previously independent populations have come into contact with each other, through range expansion (e.g. the Dutch Randstad populations, or the North France - Lille and the Belgian RRP populations). It has thus become difficult to discriminate between the respective populations. For this reason, we believe a metapopulation approach may be needed for future studies. For instance, the Rhine-Neckar center of abundance (4,010 RRPs in 2015) currently includes (previously independent) populations from Heidelberg, Neckarhausen, Mannheim, Ludwigshafen, Frankental and Worms. Birds from Frankental and Worms roost in Ludwigshafen (Detlev Franz pers. obs. ), therefore flying twice per day 8km or 18km, respectively. Moreover, RRPs roosting in Heidelberg may fly up to 24km to their breeding location [7Braun M. Die Bestandssituation des Halsbandsittichs Psittacula krameri in der Rhein-Neckar-Region (Baden-Württemberg, Rheinland-Pfalz,Hessen), 1962-2008, im Kontext der gesamteuropäischen Verbreitung. Vogelwelt 2009; 130: 77-89.]. Hence, we cannot exclude the exchange of individuals between populations, which is generally considered a main attribute of a metapopulation [59Hanski I. Metapopulation dynamics. Nature 1998; 396: 41-9. To our knowledge, the current study is the most complete demographic study regarding distribution and numbers of RRP populations in Europe, which highlights that this alien parrot has increased considerably in numbers, reaching particularly high figures in several metropolitan areas. Previous research indicated that RRP might be restrained to urban and suburban areas due to habitat suitability i.e. mature trees and nesting holes [10Strubbe D, Matthysen E, Graham CH. Assessing the potential impact of invasive ring-necked parakeets Psittacula krameri on native nuthatches Sitta europeae in Belgium. J Appl Ecol 2010; 47: 549-57. [http://dx.doi.org/10.1111/j.1365-2664.2010.01808.x] , 18Hernández-Brito D, Carrete M, Popa-Lisseanu AG, Ibáñez C, Tella JL. Crowding in the city: losing and winning competitors of an invasive bird. PLoS One 2014; 9: e100593. [http://dx.doi.org/10.1371/journal.pone.0100593] [PMID: 24945439] , 31Peck HL. Investigating ecological impacts of the non-native population of Rose-ringed parakeets (Psittacula krameri) in the UK. PhD thesis. Imperial College London 2013.] and foraging opportunities i.e. (exotic) plant diversity [52Braun M. Neozoen in urbanen Habitaten: Ökologie und Nischenexpansion des Halsbandsittichs. Diploma thesis. Philipps-Universität Marburg 2004.] and bird feeders [60Clergeau P, Vergnes A. Bird feeders may sustain feral Rose-ringed parakeets Psittacula krameri in temperate Europe. Wildl Biol 2011; 17: 248-52. [http://dx.doi.org/10.2981/09-092] ]. But with recent evidence [30Balmer DE, Gillings S, Caffrey BJ, Swann RL, Downie IS, Fuller RJ. Bird Atlas 2007-2011: The Breeding and Wintering Birds of Britain and Ireland. Thetford: BTO Books 2013.] reporting expansion of certain RRP populations outside urban core areas and availability of suitable habitat away from major cities [57Strubbe D, Jackson H, Groombridge J, Matthysen E. Invasion success of a global avian invader is explained by within-taxon niche structure and association with humans in the native range. Divers Distrib 2015; 1-11. [http://dx.doi.org/10.1111/ddi.12325] ], we speculate whether these non-urban patches (often forests with mature trees) represent the next breeding territories for the increasing RRP populations. We have gone a long-way since the pioneering work of Josephine A. Pithon [32Pithon JA. The status and ecology of the ring-necked parakeet Psittacula krameri in Great Britain. PhD Thesis. ] and Chris J. Butler [43Butler CJ. Population Biology of the Introduced Rose-ringed Parakeet Psittacula krameri in the UK. PhD thesis;. University of Oxford 2003. ], who revealed important aspects of the population biology of RRP in Europe. We know more about their population biology and ecology, as well as the effects of interspecific competition with native birds [7Braun M. Die Bestandssituation des Halsbandsittichs Psittacula krameri in der Rhein-Neckar-Region (Baden-Württemberg, Rheinland-Pfalz,Hessen), 1962-2008, im Kontext der gesamteuropäischen Verbreitung. Vogelwelt 2009; 130: 77-89., 10Strubbe D, Matthysen E, Graham CH. Assessing the potential impact of invasive ring-necked parakeets Psittacula krameri on native nuthatches Sitta europeae in Belgium. J Appl Ecol 2010; 47: 549-57. 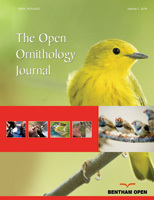 [http://dx.doi.org/10.1111/j.1365-2664.2010.01808.x] , 16Mori E, Ancillotto L, Groombridge J, Howard T, Smith VS, Menchetti M. Macroparasites of introduced parakeets in Italy: a possible role for parasite-mediated competition. Parasitol Res 2015; 114: 3277-81. [http://dx.doi.org/10.1007/s00436-015-4548-2] , 52Braun M. Neozoen in urbanen Habitaten: Ökologie und Nischenexpansion des Halsbandsittichs. Diploma thesis. Philipps-Universität Marburg 2004., 56Shwartz A, Strubbe D, Butler CJ, Matthysen E, Kark S. The effect of enemy-release and climate conditions on invasive birds: a regional test using the rose-ringed parakeet (Psittacula krameri) as a case study. Divers Distrib 2009; 15: 310-8. [http://dx.doi.org/10.1111/j.1472-4642.2008.00538.x] -58Strubbe D, Matthysen E. Predicting the potential distribution of invasive ring-necked parakeets Psittacula krameri in northern Belgium using an ecological niche modelling approach. Biol Invasions 2009; 11: 497-513. [http://dx.doi.org/10.1007/s10530-008-9266-6] ]. Nonetheless, the picture is far from complete and further research is needed. Little is known about natural enemies of RRP in Europe, predation rates and how this might influence population growth. Furthermore, underlying drivers of population growth remain poorly understood for the RRPs in Europe. Another distinct recommendation emerging from this paper is the need to determine the most efficient methods to monitor expanding parakeet populations. For large RRP populations (e.g. >10,000 birds) with scattered distribution, it currently becomes problematic to identify and count all roosts simultaneously. We therefore advocate if common bird monitoring techniques should be considered e.g. point/transect counts, sample plot surveys, atlas surveys combined with web portal data, etc. Thus, if the above-mentioned information gaps can be filled, we will obtain a more complete understanding of RRP demography in Europe and, ultimately, link it to general invasion mechanisms of alien species. The RRP, an alien bird species, is now well established in Europe with at least 90 established breeding populations in 10 countries. Since the first population appeared in the 1960’s, the RRP total population in Europe has reached a minimal number of 85,120 individuals in 2015. Whereas locally, populations might have reached carrying capacity, overall population growth patterns and statistical modeling predictions of RRP potential distribution strongly suggest that further population increases are likely. Further research is needed to understand the mechanisms underlying RRP population growth in invaded Europe, and workable methods amenable to citizen-scientists are urgently required to accurately monitor population and range dynamics of this alien, but iconic bird. The authors are indebted to all colleagues and bird experts who offered information on the status of Rose-ringed Parakeet in specific countries, as follows: Norbert Teufelbauer and Richard Zink (Austria), Viktar Fenchuk (Belarus), Gerald Driessens, Dido Gosse, Alain Paquet, Jean-Yves Paquet and Anne Weiserbs (Belgium), Nermina Sarajlic and Dražen Kotrošan (Bosnia-Herzegovina), Boris Nikolov and Sergey Panayotov (Bulgaria), Ivan Budinski and Tibor Mikuska (Croatia), Martin Hellicar and Nicolaos Kassinis (Cyprus), Jana Skorpilova, Petr Vorisek and Tomáš Najer (Czech Republic, Slovakia), Henning Heldbjerg and Thomas Vikstrøm (Denmark), Dmitrijs Boiko and Riho Marja (Estonia, Latvia, Lithuania), Aleksi Lehikoinen (Finland), Eric Barthelemy, Jean-François Bousquet, Ariane Le Gros, Christophe Pasquier and Frank Dhermain (France), Tobias Krause and Esther Koch (Germany), Lefteris Stavrak and Spyros Skareas (Greece), Karoly Nagy (Hungary), Alessio Rivola, Marco Cillerai, Gianpasquale Chiatante, Giuseppe Bogliani, Alessandro Perfetti, Enrico Borgo, Jacopo Cecere, Federico Marrone, Valentina Cumbo, Paolo Bonazzi, Nicola Ferrari, Maurizio Sighele, Marcello Grussu, Paolo Melis, Andrea Caboni, Luca Lapini, Riccardo Balsamo and Davide Righetti (Italy), Gilles Biver, Patric Lorgé and Mikis Bastian (Luxembourg), Evgenija Jordanovska (Macedonia), Denis Cachia and Nicholas Barbara (Malta), Vitalie Ajder (Moldova), Andrej Vizi (Montenegro), Magne Husby and Julian Bell (Norway), Piotr Tryjanowski and Michał Polakowski (Poland), Luis Reino and Miguel Monteiro (Portugal), Vlad Cioflec, Paul Țibu, Cristian Mihai, Emanuel Baltag, Lucian Bolboacă and Fülöp Attila (Romania), Marko Sciban and Dragan Simić (Serbia), Klemen Koselj (Slovenia), Juan Carlos Senar, José Luis Postigo Sánchez, Leticia Lopera Doblas, Marcel Gil Velasco, Cornel Dima, David Diez-Méndez, Gerard Dalmau Bonet, Alba Casals Mitjà and Marcos Pérez Osanz (Spain), Åke Lindström, Gustav Eriksson and Anders Wirdheim (Sweden), Emin Yoğurtcuoğlu (Turkey), Hannah Peck and Simon Tollington (United Kingdom) and Valentin Serebryakov (Ukraine). LGP was funded by the European Cooperation in Science and Technology, specifically for COST Action 1304 ParrotNet (mission COST-STSM-ES1304-24967 and COST-STSM-ES1304-27517). The authors would like to acknowledge the support provided by COST Action ES1304 for the realization of this manuscript. The contents of this manuscript are the authors' responsibility and neither COST nor any person acting on its behalf is responsible for the use which might be made of the information contained in it. Richardson DM, Ed. Fifty Years of Invasion Ecology: the legacy of Charles Elton. Oxford: Blackwell Publishing Ltd. Hoboken 2010. Vitousek PM, D’Antonio CM, Loope LL, Rejmanek M, Westbrooks R. Introduced species: A significant components of human-caused global change. N Z J Ecol 1997; 21: 1-16. Chiron F, Shirley S, Kark S. Human-related processes drive the richness of exotic birds in Europe. Proc Biol Sci 2009; 276: 47-53. Keller RP, Geist J, Jeschke JM, Kühn I. Invasive species in Europe: ecology, status, and policy. Environ Sci Eur 2011; 23: 1-17. Handbook of Alien Species in Europe. Dordrecht: Springer 2009. Katsanevakis S, Bogucarskis K, Gatto F, Vandekerkhove J, Deriu I, Cardoso AC. Building the European Alien Species Information Network (EASIN): a novel approach for the exploration of distributed alien species data. Bio Invasions Rec 2012; 1: 235-45. Braun M. Die Bestandssituation des Halsbandsittichs Psittacula krameri in der Rhein-Neckar-Region (Baden-Württemberg, Rheinland-Pfalz,Hessen), 1962-2008, im Kontext der gesamteuropäischen Verbreitung. Vogelwelt 2009; 130: 77-89. Strubbe D, Matthysen E. Establishment success of invasive ringnecked and monk parakeets in Europe. J Biogeogr 2009; 36: 2264-78. Strubbe D, Matthysen E. Invasive ring-necked parakeets Psittacula krameri in Belgium : habitat selection and impact on native birds. Ecography (Cop) 2007; 30: 578-88. Strubbe D, Matthysen E, Graham CH. Assessing the potential impact of invasive ring-necked parakeets Psittacula krameri on native nuthatches Sitta europeae in Belgium. J Appl Ecol 2010; 47: 549-57. Dodaro G, Battisti C. Rose-ringed parakeet (Psittacula krameri) and starling (Sturnus vulgaris) syntopics in a Mediterranean urban park : evidence for competition in nest-site selection? Belg J Zool 2014; 144: 5-14. Orchan Y, Chiron F, Shwartz A, Kark S. The complex interaction network among multiple invasive bird species in a cavity-nesting community. Biol Invasions 2012; 15: 429-45. Hernández-Brito D, Luna A, Carrete M, Tella JL. Alien rose-ringed parakeets (Psittacula krameri) attack black rats (Rattus rattus) sometimes resulting in death. Hystrix 2014; 25: 121-3. Menchetti M, Scalera R, Mori E. First record of a possibly overlooked impact by alien parrots on a bat (Nyctalus leisleri). Hystrix 2014; 25: 61-2. Peck HL, Pringle HE, Marshall HH, Owens IP, Lord AM. Experimental evidence of impacts of an invasive parakeet on foraging behavior of native birds. Behav Ecol 2014; 25: 582-90. Mori E, Ancillotto L, Groombridge J, Howard T, Smith VS, Menchetti M. Macroparasites of introduced parakeets in Italy: a possible role for parasite-mediated competition. Parasitol Res 2015; 114: 3277-81. Franz D, Krause T, Simon L. Zur Verbreitung und Biologie des Halsbandsittichs Psittacula krameri am Oberrhein (Rheinland-Pfalz) Distribution and biology of Rose-ringed Parakeets Psittacula krameri in the Upper Rhine valley. Rhineland-Palatinate: Fauna Flora Rheinland-Pfalz 2002; 28: pp. 237-51. Hernández-Brito D, Carrete M, Popa-Lisseanu AG, Ibáñez C, Tella JL. Crowding in the city: losing and winning competitors of an invasive bird. PLoS One 2014; 9: e100593. Czajka C, Braun MP, Wink M. Resource Use by Non-Native Ring-Necked Parakeets (Psittacula krameri) and Native Starlings (Sturnus vulgaris) in Central Europe. Open Ornithol J 2011; 4: 17-22. Blackburn TM, Lockwood JL, Cassey P. Avian Invasions: The Ecology and Evolution of Exotic Birds. USA: Oxford University Press 2009. Kumschick S, Nentwig W. Some alien birds have as severe an impact as the most effectual alien mammals in Europe. Biol Conserv 2010; 143: 2757-62. Strubbe D, Shwartz A, Chiron F. Concerns regarding the scientific evidence informing impact risk assessment and management recommendations for invasive birds. Biol Conserv 2011; 144: 2112-8. Forshaw JM. Parrots of the World. 2nd ed. London: Princeton University Press 2010. Jackson H, Strubbe D, Tollington S, Prys-Jones R, Matthysen E, Groombridge JJ. Ancestral origins and invasion pathways in a globally invasive bird correlate with climate and influences from bird trade. Mol Ecol 2015; 24: 4269-85. Commission Regulation (EC) No 318/2007 of 23 March 2007 laying down animal health conditions for imports of certain birds into the Community and the quarantine conditions thereof. Official J Eur Union 2007. Simberloff D. The role of propagule pressure in biological invasions. Annu Rev Ecol Evol Syst 2009; 204: 81-102. Blackburn TM, Lockwood JL, Cassey P. The influence of numbers on invasion success. Mol Ecol 2015; 24: 1942-53. Strubbe D, Matthysen E. Short communication A radiotelemetry study of habitat use by the exotic Ring-necked Parakeet Psittacula krameri in Belgium. Ibis 2011; 153: 180-4. Casagrande DG, Beissinger SR. Evaluation of four methods for estimating parrot population size. Condor 1997; 99: 445-57. Balmer DE, Gillings S, Caffrey BJ, Swann RL, Downie IS, Fuller RJ. Bird Atlas 2007-2011: The Breeding and Wintering Birds of Britain and Ireland. Thetford: BTO Books 2013. Peck HL. Investigating ecological impacts of the non-native population of Rose-ringed parakeets (Psittacula krameri) in the UK. PhD thesis. Imperial College London 2013. Pithon JA. The status and ecology of the ring-necked parakeet Psittacula krameri in Great Britain. PhD Thesis. van Kleunen A, Kampichler C, Sierdsema H. De verspreiding van Halsbandparkiet en andere in het wild voorkomende papegaaiachtigen (Psittaciformes) in Nederland. In: Sovon-rapport 2014/31. Nederland, Nijmegen: Sovon Vogelonderzoek 2014. Klaassen O. Halsbandparkieten in Nederland in de winter van 2013/14 In: Sovon-rapport 2014/16. Nederland, Nijmegen: Sovon Vogelonderzoek 2014. Weiserbs A. Especes invasives: Le cas des Psittacides en Belgique. Incidences, evaluation des risques et eventail de mesures. Aves 2010; 47: 21-35. Clergeau P. L’invasion de l’espèce exotique, la Perruche à collier Psittacula krameri. Report for Conseil Général des Hauts-de-Seine. 2014. Gedeon K, Grüneberg C, Mitschke A, et al. Atlas Deutscher Brutvogelarten (Atlas of German Breeding Birds). Münster: Stiftung Vogelmonitoring Deutschland und Dachverband Deutscher Avifaunisten 2014. Fraticelli F. The rose-ringed parakeet Psittacula krameri in a urban park : demographic trend, interspecific relationships and feeding preferences (Rome, central Italy). Avocetta 2014; 1-6. Musgrove A, Aebischer N, Eaton M, et al. Population estimates of birds in Great Britain and the United Kingdom. Br Birds 2013; 106: 64-100. Lack P. The Atlas of Wintering Birds in Britain and Ireland. T. & A.D. Poyser. Calton 1986. Pithon JA, Dytham C. Census of the British Ring-necked Parakeet Psittacula krameri population by simultaneous counts of roosts. Bird Study 1999; 46: 37-41. Pithon JA, Dytham C. Distribution and population development of introduced Ring-necked Parakeets Psittacula krameri in Britain between 1983 and 1998: Of the three subpopulations, only the one west of London was increasing, with little spread. Bird Study 2002; 49: 110-7. Butler CJ. Population Biology of the Introduced Rose-ringed Parakeet Psittacula krameri in the UK. PhD thesis;. University of Oxford 2003. Fletcher M, Askew N. Review of the status, ecology and likely future spread of parakeets in England 2007. Bijlsma RG, Hustings F, Camphuysen CJ. Algemene en schaarse vogels van Nederland (Avifauna van Nederland 2)/ Common and scarce birds of the Netherlands. Haarlem/ Utrecht 2001. Hustings F, Vergeer JW. Halsbandparkiet Psittacula krameri SOVON Vogelonderzoek Nederland Atlas van de Nederlandse Broedvogels 1998-2000 Nederlandse Fauna 5. Leiden: Nationaal Natuurhistorisch Museum Naturalis/KNNV Uitgeverij & European Invertebrate Survey-Nederland 2002; pp. 268-9. Synaeve A. Parkietentelling. Passer 2010; p. 4. Clergeau P, Vergnes A, Delanoue RR. La Perruche à collier Psittacula krameri introduite en Île-de-France: distribution et régime alimentaire. Alauda 2009; 77: 121-32. Clergeau P, Leroy O, Lenancker P. Dynamique de population de la Perruche à collier Psittacula krameri introduite en Île-de-France. Alauda 2015; 83: 165-74. Wink M, Dietzen C, Gießing B. Die Vögel des Rheinlandes Atlas zur Brut und Wintervogelverbreitung 1990-2000. Beiträge zur Avifauna Nordrhein-Westfalens; 36; 2005. Grüneberg C, Sudmann SR, Weiss J, et al. Die Brutvögel Nordrhein-Westfalens. In: NWO&LANUV (Hrsg). LWL-Museum für Naturkunde, Münster 2013. Braun M. Neozoen in urbanen Habitaten: Ökologie und Nischenexpansion des Halsbandsittichs. Diploma thesis. Philipps-Universität Marburg 2004. Akyıldırım B, Arslan M. Türkiye’ye Yerleşen Egzotik Kuş Türleri: Yeşil papağan (Psittacula krameri) ve İskender papağanı (Psittacula eupatria) 2009. Chiron F, Shirley SM, Kark S. Behind the Iron Curtain: Socio-economic and political factors shaped exotic bird introductions into Europe. Biol Conserv 2010; 143: 351-6. CITES trade statistics derived from the CITES Trade Database. 2014. Shwartz A, Strubbe D, Butler CJ, Matthysen E, Kark S. The effect of enemy-release and climate conditions on invasive birds: a regional test using the rose-ringed parakeet (Psittacula krameri) as a case study. Divers Distrib 2009; 15: 310-8. Strubbe D, Jackson H, Groombridge J, Matthysen E. Invasion success of a global avian invader is explained by within-taxon niche structure and association with humans in the native range. Divers Distrib 2015; 1-11. Strubbe D, Matthysen E. Predicting the potential distribution of invasive ring-necked parakeets Psittacula krameri in northern Belgium using an ecological niche modelling approach. Biol Invasions 2009; 11: 497-513. Hanski I. Metapopulation dynamics. Nature 1998; 396: 41-9. Clergeau P, Vergnes A. Bird feeders may sustain feral Rose-ringed parakeets Psittacula krameri in temperate Europe. Wildl Biol 2011; 17: 248-52.